It was spring in Ypres, and outside the cafe, the sky thundered black, and torrential rain beat down on the square's great market square. Inside, it was warm and cheery, and I sat talking to Theo Toebusch, a Dutch journalist who had driven across the border to write a story on an unusual meeting to be held in the city's Cloth Hall. This grand building is a 1920s rebuild of the medieval original destroyed during the First World War, and is now the home of the In Flanders Fields Museum. 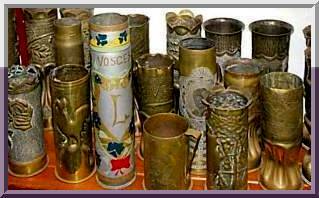 The event was the first-ever conference on the strange and astonishing variety of Great War objects known as "Trench Art" - items made from the recycled debris of conflict, from bullets to bones, from artillery shells to wood, stone and cloth. Over 100 trench art aficionados from around the world had journeyed to Belgian Flanders to participate in this unique gathering. They included academics, collectors, museum specialists, dealers and artists who make modern examples of the genre. Over the past decade, trench art has become more than the passion of expert collectors and knowledgeable militaria dealers. It is now part of mainstream academic interest in the material culture of twentieth century war. When I was first ambushed by these extraordinary objects in 1997, not a single book was published and not one article written about their social or historical importance. Today, there are a dozen books, innumerable articles, and several stunning websites. Trench Art is firmly established in the literature of archaeology, anthropology, and the cultural history of the Great War. Museuems, also, had shown no interest, except for one small exhibition in Zonnebeke near Ypres, in 1972. In the past decade, many local exhibitions have been put on around the world, and major ones have occurred in Germany, Britain, France, Hungary, the USA, and Belgium. The dramatic rebirth of trench art inspired Dominic Dendooven and Piet Chielens of the In Flanders Fields Museum, to suggest a five-year rolling programme of temporary exhibitions. Each would highlight a different aspect of trench art, and the series would culminate in an international conference in 2009. As we hoped, the conference was a meeting of minds, and full of fascinating highlights. Joost Vaesenof the Free University in Brussels, talked passionately about Belgian collecting of war memorabilia after 1918, and Philip Dutton, standing in for Paul Cornish, gave an insightful account of the Imperial War Museum's trench art treasures. Paul Gough, from the University of the West of England, engaged the audience with his research on the surveillance sketchbooks of soldier-artists on the Western Front, and Annette Becker of the University of Paris, surveyed the unusual trench art made by prisoners of war and civilians under occupation. Suitably refreshed after an excellent lunch, the afternoon began with Patrice Warin, arguably the foremost French collector of trench art. He led us expertly through the dazzling peculiarities of French trench art which he has chronicled so thoroughly in his lavish books. A rare insight into the Italian Front was supplied by Isabelle Brandauer of the Tirolerlandmuseen in Innsbruck. She gave a scintillating account of trench art's role in everyday life of the common soldier in Italy, Austria, and Slovenia. We were then treated to an impassioned address by Asim Donlic, of the Education and Open Network in Sarajevo, who explained why modern studies of trench art are so important in Bosnia. Using techniques and styles harking back to Medieval Ottoman times, Muslim metalsmiths make stunning trench art from the empty shell cases left over from the artillery bombardment of the city during the terror of the Bosnian War between 1992 and 1995. Trench art is not unique to the Great War. Gilly Carr from Cambridge University revealed her discoveries about the role of trench art in the Second World War occupation of the Channel Islands. This was followed by an account of the extraordinary German 'Iron Nail Memorials' by Hans-Christian Pust of Stuttgart's Bibliothek fur Zeitgeschichte. This packed opening day of talks concluded with an innovatory flourish, when four collectors took the stage to enlighten us with their own very personal experiences. Jane Kimball, the doyen of American collectors, James Brazier, surely Britain's most knowledgeable expert, David Cohen, a specialist war-art dealer, and the Great War authority Andre Tonge - all drew on decades of experience to give insights into their individual fascinations with trench art. A splendid evening followed, with the opening of the museum's exhibition 'The Great War Collection', a reception, a Last Post at the Menin Gate at which a conference wreath was laid, and a conference dinner on the city's Vauban ramparts. Our second day began with Dominic Dendooven giving a fascinating (and suprisingly, the first-ever) talk on the origins of the In Flanders Fields Museum. After a lively discussion and lunch, we trooped onto a coach for a personalised tour of the area's cafe-museums and their trench art collections: Hooge Crater, Sanctuary Wood, the Canada Inn, the Musee Blockhaus Pioneer 14-18, and the Ramparts War Museum - all revealed different aspects of the daily life of Great War soldiers, and the influence of modern day battlefield tourism. The last day dawned bright and warm, and before the closing public lecture, there was a display by three makers of modern-day trench art. Steve Hurst, a sculptor working mainly in bronze, demonstrated his techniques, and stood alongside the Belgian metalsmith-artist Rik Ryon, who makes powerful and emotive figures forged from the driving bands of artillery shells fired between 1914 and 1918. Opposite them was Hamad Khalaf, a native of Kuwait, who experienced Saddam's invasion in 1991, and who gathered up abandoned boots and helmets while helping in post-war battlefield clearance. He paints these icons of modern war with scenes from Classical Greek mythology. Participating in the Collecting War conference was a compelling experience, which alternated between academic detail and decades of insight and familiarity by collectors. In the end we all learned something new, made new friends, and put faces to years of correspondence by email and letter. Trench art and the personal stories it contains had waited some 90 years for this event, and we all hope that the next one will be a lot sooner !